Tree's are my favorite subject to photograph. I love their uniqueness and rugged individualism like qualities. Some tree's in particular exert stoic like qualities even in the face of a harsh climate. 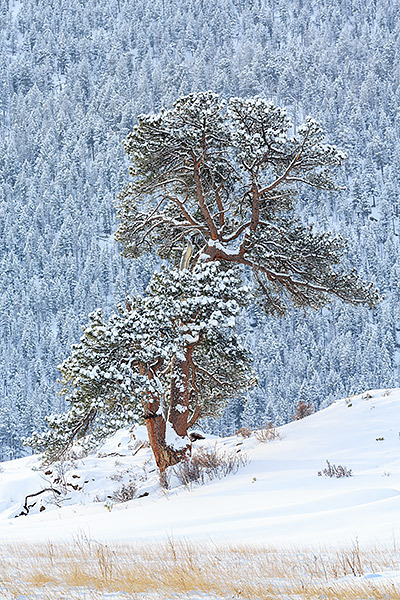 Floods, fires, wind, and snow have not caused this beautifuly shaped Ponderosa pine to waver. Located along the banks of the Big Thomspon river in Moraine Park, this tree has seen its share of snowy and cold days. Standing alone in Moraine Park it looks as though its standing proud amongst a crowd of tree's telling tall tales of it's struggle for surrival through snow, floods and fires here in the Rocky Mountains of Colorado. Photo © copyright by Thomas Mangan.